What does Aphthous Stomatitis look like? Ulcers present inside mouth may manifest in various forms. Aphthous stomatitis refers to a specific type of mouth ulceration which causes pain and discomfort. This disease can afflict individuals of any age-group, from children to elderly. Also often referred to as “Canker sore”, it is an ulcerous mouth condition characterized by painful and superficial sores. Lips, cheek lining and tongue are the worst affected and they may extend up to the upper portions of the throat in some cases. It is basically the ulceration of the mucous lining inside the mouth which is not contagious in nature. The ICD 9 code of this disease is 528.2. Mouth ulcers of this type are found more in women than men. It is common in babies, toddlers and adults. Around 50% of the global population seems to be affected with this disease. Herpetiform recurrent aphthous ulcer and major recurrent aphthous ulcer are not so common. Almost 80% of the cases reported show prevalence of recurrent aphthous ulcer minor. This ulcer is quite common in people. They may take around 2 weeks to heal. They affect cheeks, tongue and lips of individuals, especially children after crossing pubertal stage. These lesions usually leave scars on healing. This is a severe type of ulcer that develops in a cluster and majorly affects females usually after they turn 18 years old. However, they lead to excessive pain. There is redness in the site of ulcer in the beginning. 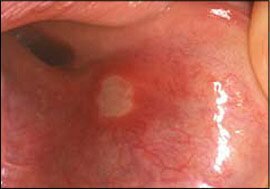 This further develops into open ulcer which attains yellowish or white form and gets surrounded by a reddish circle. Lesions in minor ulcer are surrounded with grayish yellow halo. This coloration of the ulcer is caused by the deposition of fibrin which helps in blood clotting. The lesions of this form are somewhere around 3 and 10 mm in diameter. Both major and minor ulcers look about the same. However, the borders of these lesions may spread over keratinized regions. Their size is also bigger than the previous. They attain a diameter over 10 mm. Herpetiform types form lesions of diameter around 1to 3mm although they do not result in scars. Before the ulcer appears on the site, it shows signs like burning or itching. It takes a few days to develop into a red bump or spot. Painful sensations arise after the development of the sore. The lips often swell up in case of minor ulcers. This is doubled when the lymph nodes swell up and become painful. It is made worse by fever and painful gums. These sores are prone to secondary infections which lead to more symptoms. Lesions may occur again even after getting cured. Several other diseases may lead to ulcers in the mouth. Gastrointestinal and oropharyngeal ulcers may be the cause for them. Doctors should conduct a differential diagnosis to rule out the possibility of the symptoms reported by a patient as effects of these disorders. Use of over-the counter mouthwashes, to eliminate painful sensations. Mouthwashes which contain benzydamine hydrochloride are known to be anesthetic which reduces pain. But these may be unsuitable for children. Using I-Lysine 500 mg, proven to be quite effective in curing herpetic ulcers. Use of topical medicines, to reduce swelling and pain. Avoiding spicy and acidic food, which is important to restrict further irritation in the sores. Applying fresh aloe vera juice over the sores, for soothing effect. Use of Licorice root, an effective natural treatment for the canker sores. Tea tree oil, considered to be another useful natural cure. Gargling with coconut milk, another effective remedy for recurring sores. Herpetic stomatitis is an oral condition that develops when the mucosa of the mouth becomes acutely infected along with the development of vesicle. It is mainly the result of the Herpes simplex virus. These vesicles may rupture and cause tremendous local pain. Aphthous stomatisis, on the other hand, is caused by factors other than viral infection – as already explained. Protecting dental braces with wax, to minimize abrasions in the mouth. Use of non-alcoholic mouthwashes, for reducing the occurrence of the disorder and providing relief from pain. Though using toothpaste without sodium lauryl sulfate doesn’t lessen the incidence of these ulcers, it can definitely help in easing the pain and facilitate healing of ulcers. Minor recurrent aphthous stomatitis and herpetiform ulcer seem to be limited over a certain period of time. Major ulcer can play havoc on the health of sufferers, However, proper medical intervention ensures a good prognosis like the other forms. The condition is not morbid unless the canker is associated with inflammatory bowel disease or Behçet syndrome. Minor ulcers heal in about 10 to 14 days although the herpetiform ulcers may take even a month to heal.